Is there a better alternative to Mail Call? Is Mail Call really the best app in Email and Messaging category? Will Mail Call work good on macOS 10.13.4? 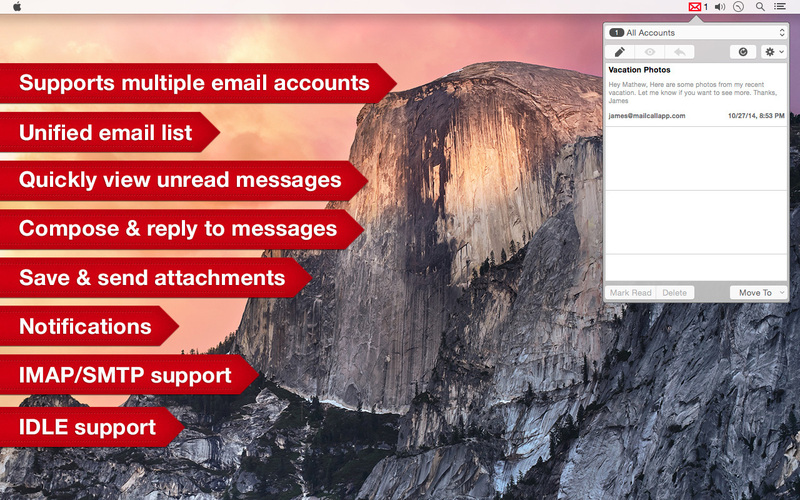 Mail Call is a full-featured mail notifier for email accounts that support IMAP. Be notified when unread messages come in, and be able to quickly react to them by viewing, replying, moving, deleting, and more! Upon launching, Mail Call can be opened and closed by selecting the mail icon in the menu bar. Mail Call does not currently support the POP protocol. Mail Call only presents email messages marked as unread. Mail Call needs a rating. Be the first to rate this app and get the discussion started! For any issues and feedback, please contact support at contact@mailcallapp.com.